For this post I have bought SF Trooper form 3dmodels-textures. It’s cheap but as the price quality is low as well. I won’t recommend buying this asset for your game. It’s lacking animations and it’s rigged badly. It’s a challenge to create procedural generated animations from asset that don’t have enough animations. What I’ve done here you can create in your own custom character. I will let you know about bought assets and if I recommend them for games. At this point I would like to inform you guys that you can always donate ShooterTutorial (right side of the blog) each donation will be used to buy better assets. When buying characters with animations outside Unreal Engine Marketplace you need to be really careful. Check if there is 7 days turn back guaranty. Current there isn’t any good Sci-Fi characters on Marketplace and I will use different stores. Now if you see that animation isn’t looping correctly there is great option in content browser to add looping frames (thanks Epic!) you can do this couple of times to add more looping interpolation frames. I have this problem on almost every looping animation from SF Trooper. Another useful thing is that you can delete frames. So if you see that on first frame character is lying down and on second frame it’s up you can delete first frame. Again thanks Epic for this feature! Next really helpful tool is animation record. SF Trooper don’t have stand with rifle idle so I created stand pose using this feature. Just one frame. You should take your time and learn these tools. They help a lot if you don’t have animation guy in your team and you are buying animations from stocks! Name it Killer_StandToWalk. 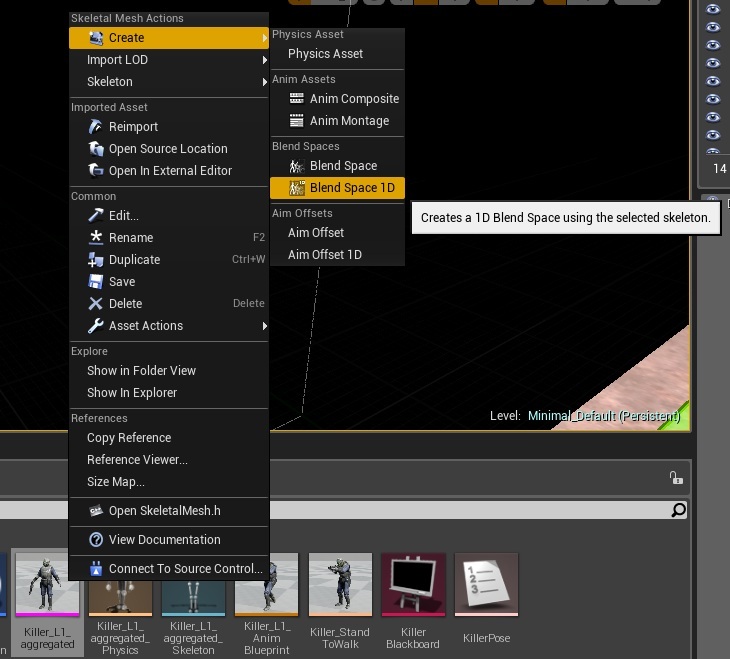 Basically Blend Space 1D will blend two animations on given input. You can read about Blend Spaces in my older tutorial blog. For walk use Walk_Rifle_Shoot – basically walking animation with gun pointed towards. For stand animation I’ve used my stand pose. You can use stand idle animation with gun still pointed towards. You can always use physics like in Physics_Animations map in Content Examples from Marketplace. Now in event graph let’s take care of speed and hit reactions bools. I wasn’t able to print screen of whole Sequence but it’s the same thing as above but with variables for different hit element. Here’s a screen with rest of it. You should get the idea. Now let’s move to Anim Graph. We are using here LookAt node which is really great if you want to rotate heads, arms or whole character toward a point. Now let’s blend upper body with lower body. You can see first Transform Modify Bone node for hit reaction. Here’s the rest. 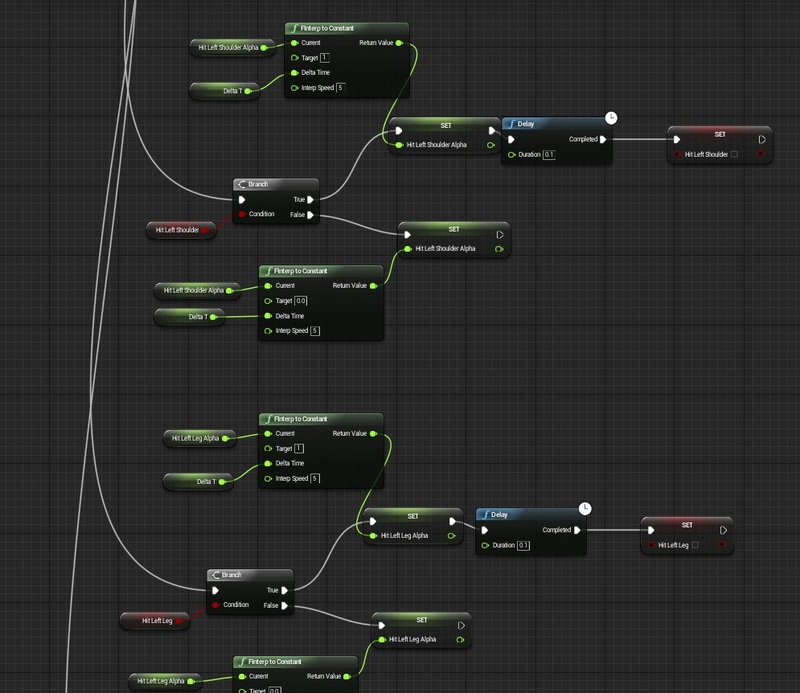 Basically if you select this node you will see possibility to change the values in editor. (but they need to be connected to Final Animation Pose! And Alpha should be set to 1!) 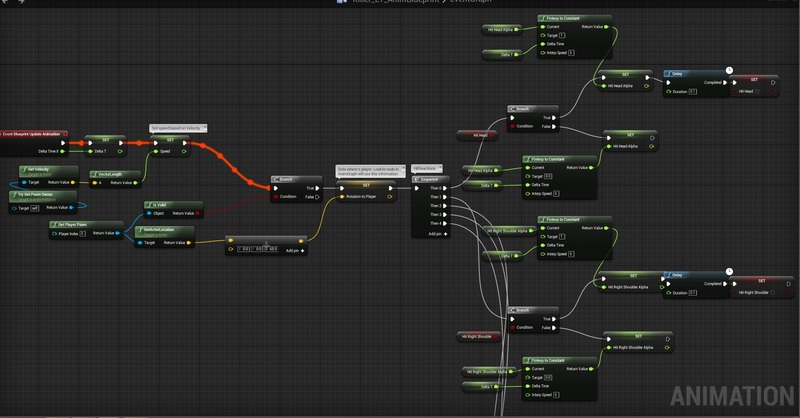 Using this you are creating additive information for animation. After hit additive animations it’s going to Final Animation Pose. You can test it out by switching bools, but make sure you don’t have any “cast to” or “is valid nodes” in your event graph. Animation blueprint is almost done, we don’t have an event for switching the bools. Now create two Animation Montages. To create Animation Montage from animation just right-click on the animation -> Create -> AnimMontage. The best part of AnimMontages is they can be assigned to slot. We are using this to blend upper body with full body. 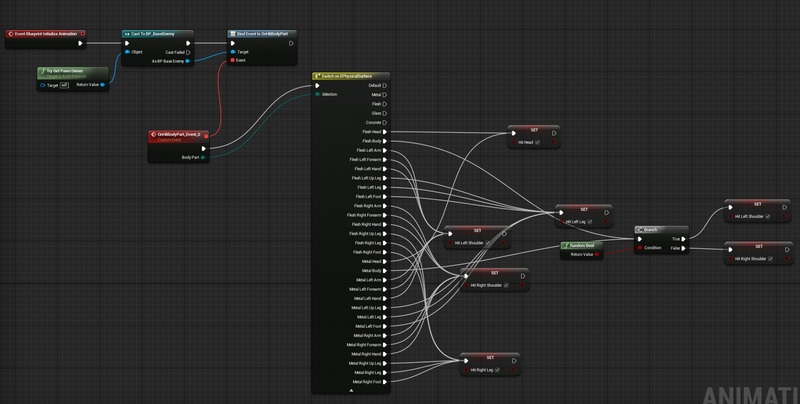 Now go back to your animation blueprint and let’s bind OnHitBodyPart dispatcher. Yea it’s messy. I’m using this big enum because maybe later it will be handy. You could prepare your own enum with smaller amount of body types. Now create new blueprint extending from BTTask_BlueprintBase named BT_KillerCalculateMoveLocation. Add one variable to it named Location from Blackboard Key Selector and make it Editable. Thanks to this we will be able to choose blackboard data in behavior tree. Add Event Receive Execute. It will be our task to find location near player. Now create new Behavior Tree named BT_Killer. It’s hard to explain what’s the setup so here’s a video. To run the behavior tree we need to create AIController. To do this create new blueprint extending from AIController. 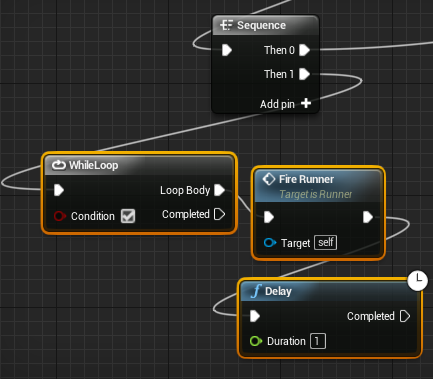 Name it BP_Enemy_TrooperAI and in Begin Play just add Run Behavior and select your created behavior tree. It’s really simple AI and its great way of teaching AI. Just place this actor to your level and check it out! 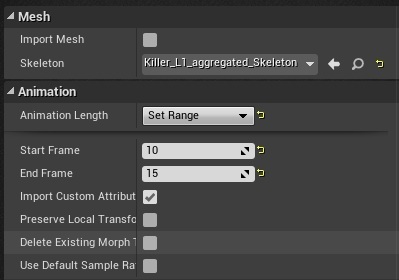 Now if you want to see your ragdoll you need to create Physical Asset from skel mesh. I won’t tell you how to do this but watching tutorial from Epic is the best way to teach how to prepare phys assets for ragdoll. After watching you should be able to create this by yourself! Time Spent on writing this tutorial: 5h. What about attaching a weapon to the enemy? I may have skipped over it (currently scanning over this and the previous tutorial) and did not see it mentioned. This enemy have weapon attached in animation. You should read marine tutorial instead. 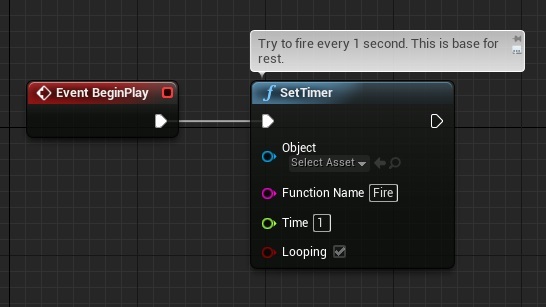 Can you show me how last part should look in 4.9(there is no longer “set timer”)? I do this: http://i.imgur.com/TdqIS2R.png and when I hit play(only on map with that enemy) editor freezes and then stops responding. Tutorial Was done using 4.8. In 4.9 Epic added new method to use timers I will check that later and let you know here. In the meantime you could check on forums how to use new timers. How would I possibly go about setting up is a wanted the enemy to shoot a projectile based weapon ? i tried to set some values but still nothing… (it once calculate location where to move and looping MoveTo command but it doing nothing). But I found a problem: I can’t rotate a bone with physics collision(body instance) on that. Is this a bug or intended? Hello, I’m needing help on the moving, I have tried to put this together and using tips i placed a NavMesg but that makes the AI glide full speed towards the camera, spin around then continue to fire,Help please! or i can just do the last one for my Game test …or each tutorial indipendant ?? i would like to see a tutorial with a custom death animation and a melee attack on the base enemy.